It was a weekend to giving up the cabin fever. Saturday was clear and sunny. 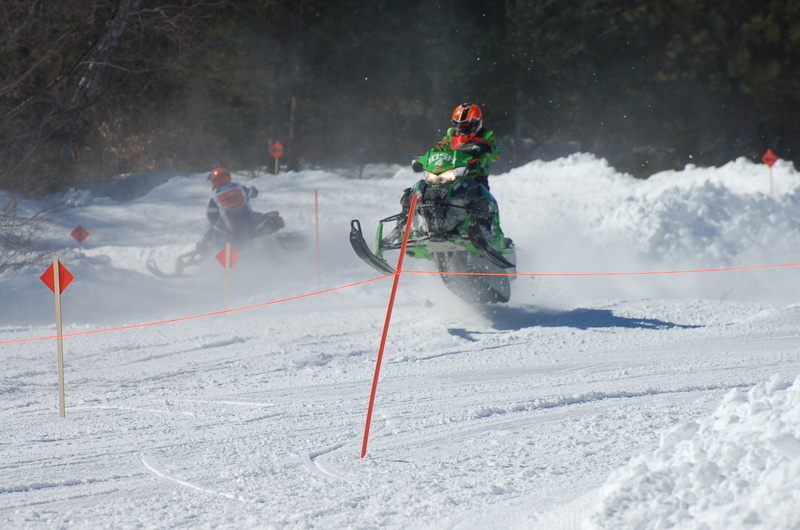 The temperature reached a balmy 20 degrees as I set off down the road for the Snowmobile Races in Dublin NH. 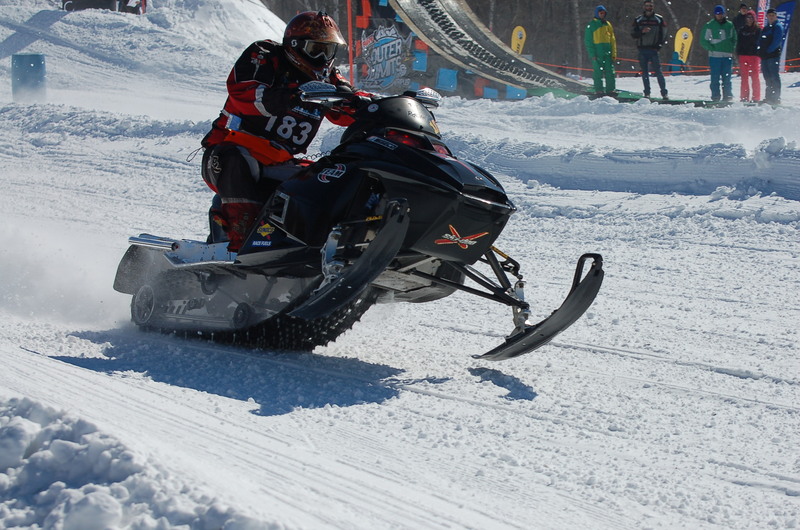 There is an entire community of winter sports enthusiasts out there who have very expensive toys and they make the most of what falls from the sky. I have an aversion to the noise and smell of all that exhaust (probably liberally mixed with testosterone) but thought it might be a good way to get out and take some shots. Laura from TouringNH.com is traveling but her husband Steve was most accommodating and met me with camera in hand. 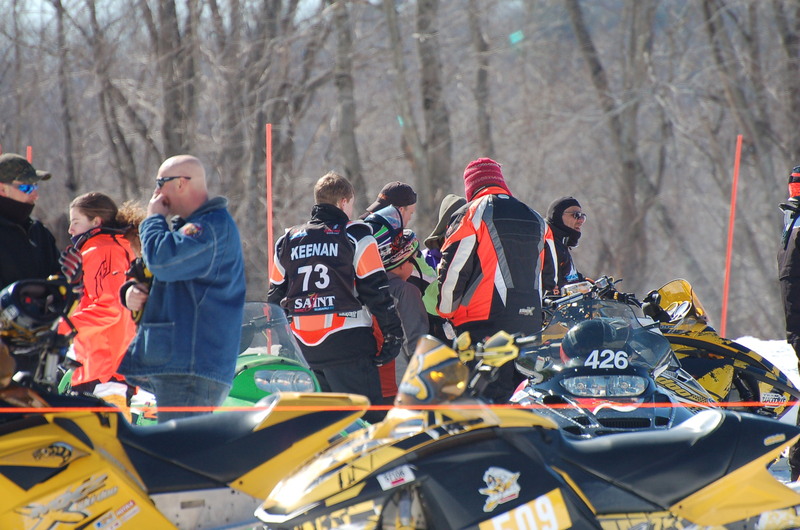 He knew only slightly more about the sport than I, so we wandered and marveled at the people, their machines and the speeds. I’m sure if you came to an equestrian event with me you would be just as baffled. I was hoping for high jumps and spectacular stunts. The program did mention my $15 bought me “ring side” seats for the professional stunt riders later in the day. I was afraid I would be unable to feel my toes by then. Sunday wasn’t much warmer but I was committed to be outside. I strapped on my snow shoes and called to Alice. My plan was to hike up to the back of my property and see how the snow had softened and healed the scars of the logging operation. Alice did her best but about half way she finally sat down. Even packing a trail with the snow shoes did little for her short legs. I could see this was not her idea of fun, so we turned back. Then I was off to the barn. It has been tough to get out and ride this winter. Work during the week and moving snow every weekend has curtailed my adventures. Lauren met me with a new saddle she wanted to try. We set off along the trail picking easy routes that were fairly well packed. Stepping off the trail meant wading through chest-deep drifts. In comparison to Saturday’s outing, it was peacefully quiet and the air was clear and clean. Blessing stopped at the open brook for a long cool drink. 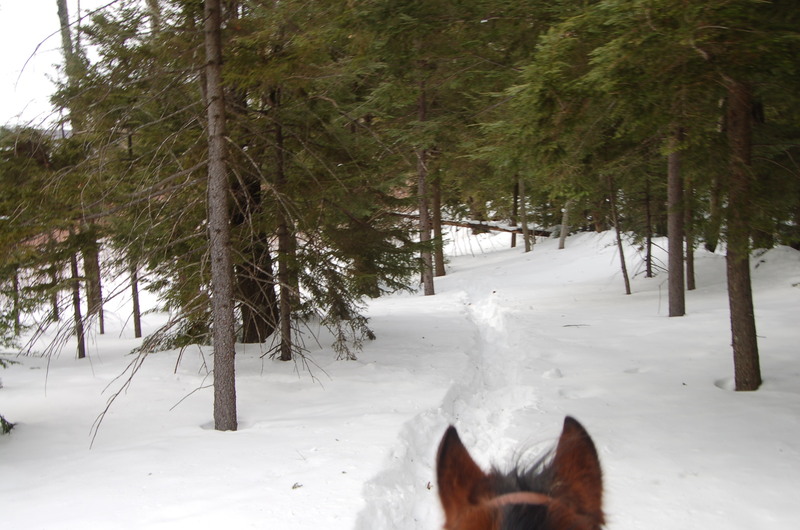 I made several attempts to snap shots as we rode along but the ride was particularly bumpy as hooves broke through the trail regularly and it felt a little like riding a merry-go-round with all the up and down movements.. 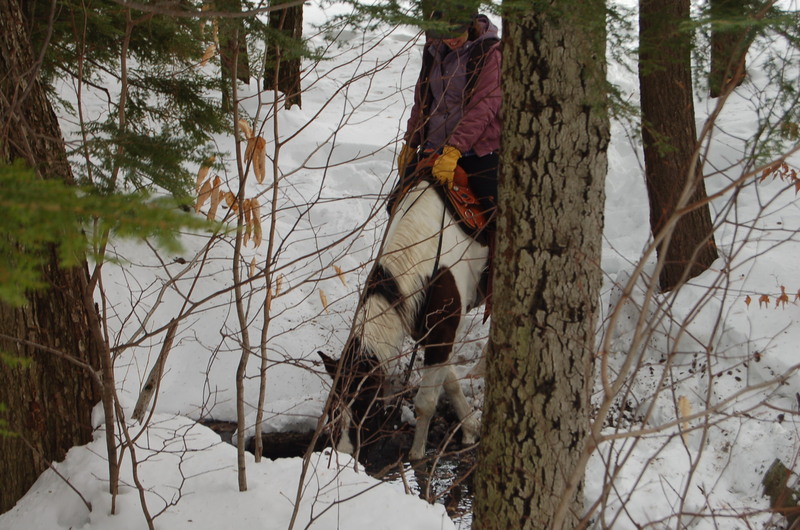 When we reached to cabin at the top, Jen rode up on Aspen. The sky was clear and the horses were steaming with that warm aroma of horse sweat that I love. It was a very good weekend to Just Get Out! This entry was posted in memoir. 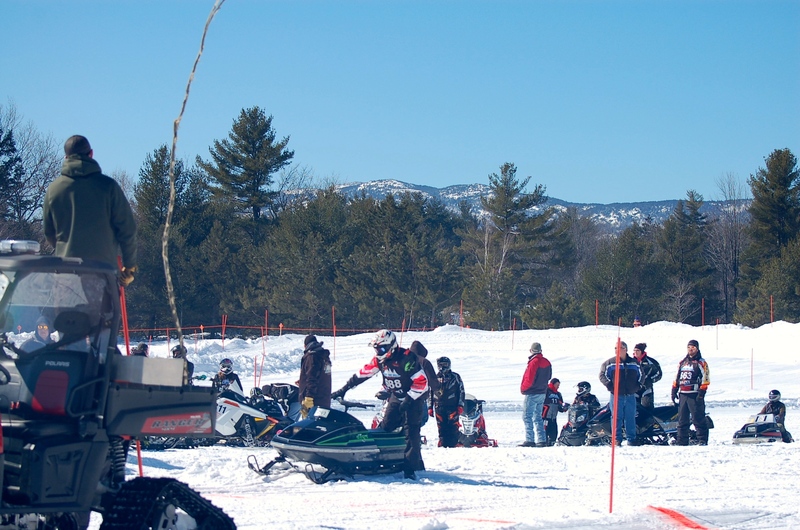 Tagged horses, snow shoeing, snowmobile racing, trail riding, winter sports. 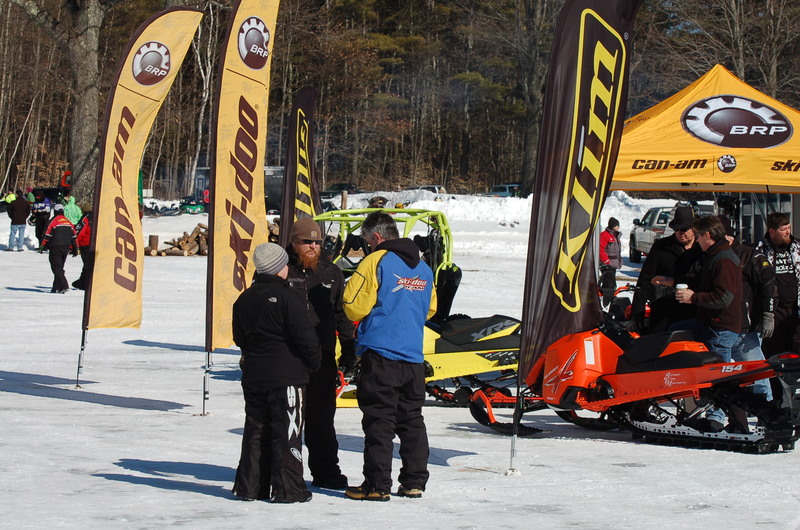 Your Sunday idea of a winter day out was more appealing to me. Wow! Thanks Annie. It was much quieter and more to my liking as well. 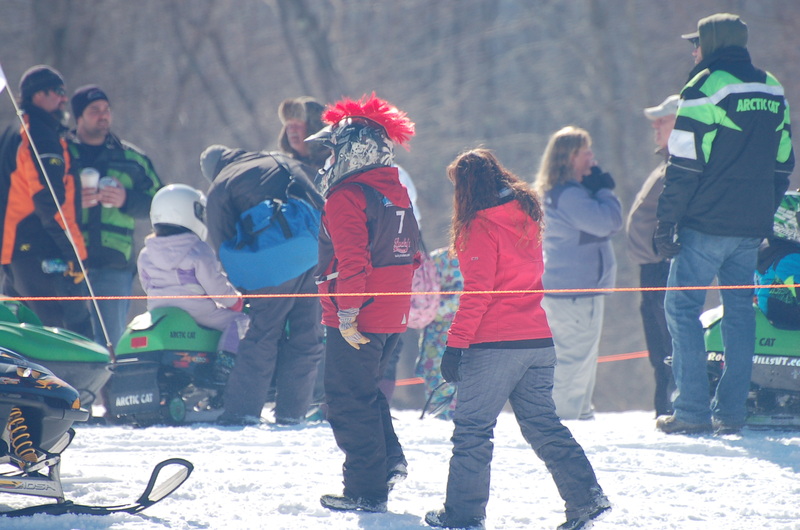 I am amazed at how many different ways people find to enjoy winter! Everyone is desperate to get out and stretch their legs for fun- not shoveling! So true, Phil. Anything to avoid the pile of snow slowly sliding off the roof! Looks quite tricky. A flame breathing dragon would be very popular. Suddenly snow doesn’t look quite so forbidding. Love the horse ride shots. As you can see, Susan, if you bundle up enough, anything can be fun! 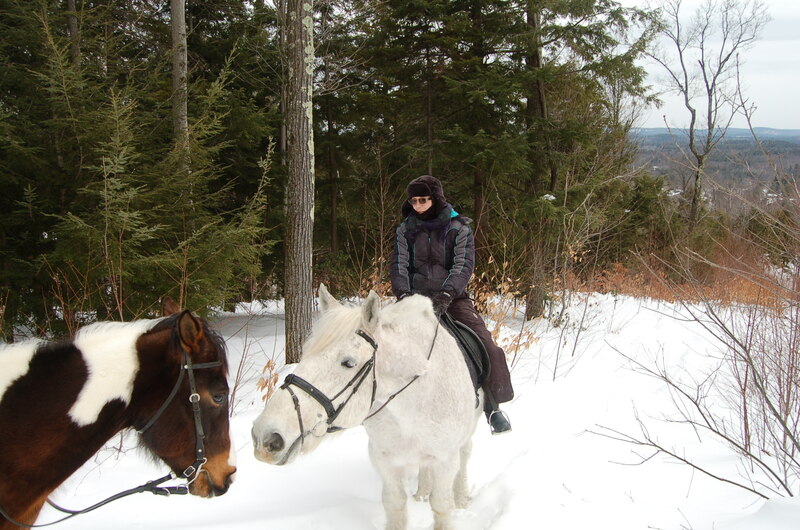 Riding in winter is one of my favorite activities – no bugs!! The ride through the snow looks like fun. I’m glad you got outside even if it did fell as if your toes were going to fall off. The temps have gotten up to 40 degrees Marie these last few days. Snow is melting, icicles are falling and folks are out in t-shirts! Gotta love New Hampshire! !